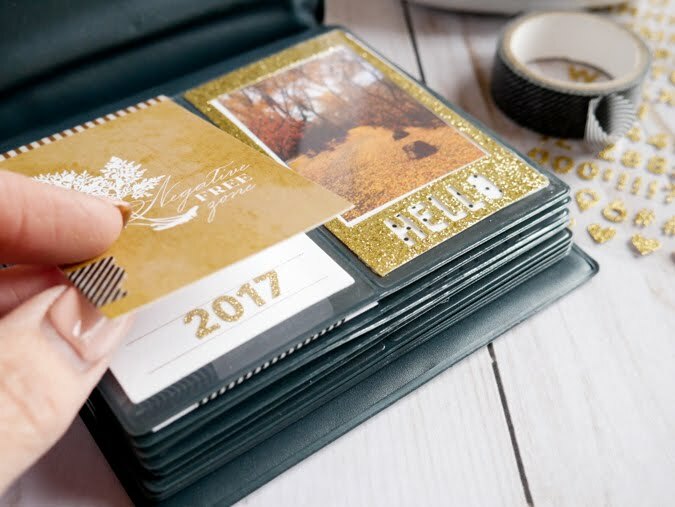 Start the gift making season with the Instax Vintage Flip Album. 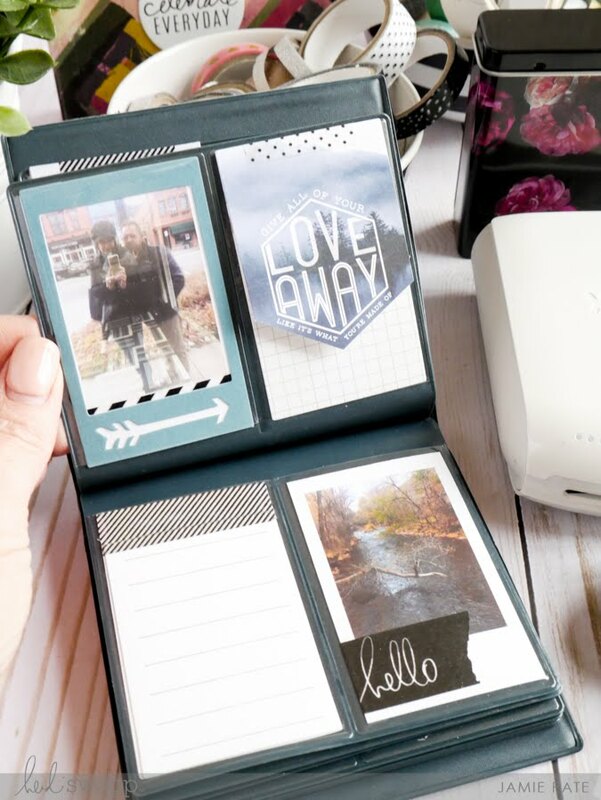 One of my most favorite Instax Vintage Flip albums is this one pictured above. 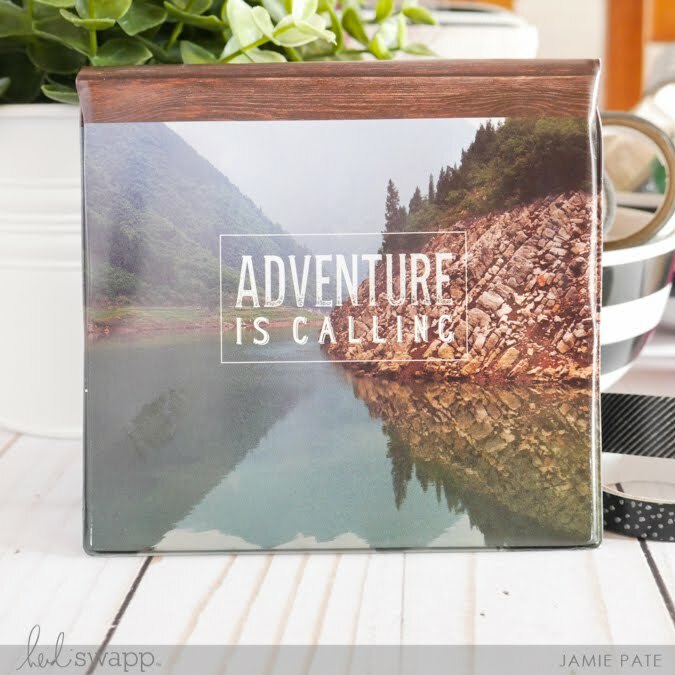 The Adventure Is Calling mini photo flip book. I mean that photo alone! The title is fitting for a variety of stories to be told. I chose this book to start my gift making for Christmas this year. Yes. I did say gift making. Let's go people! You can find the collection at Michaels Stores. 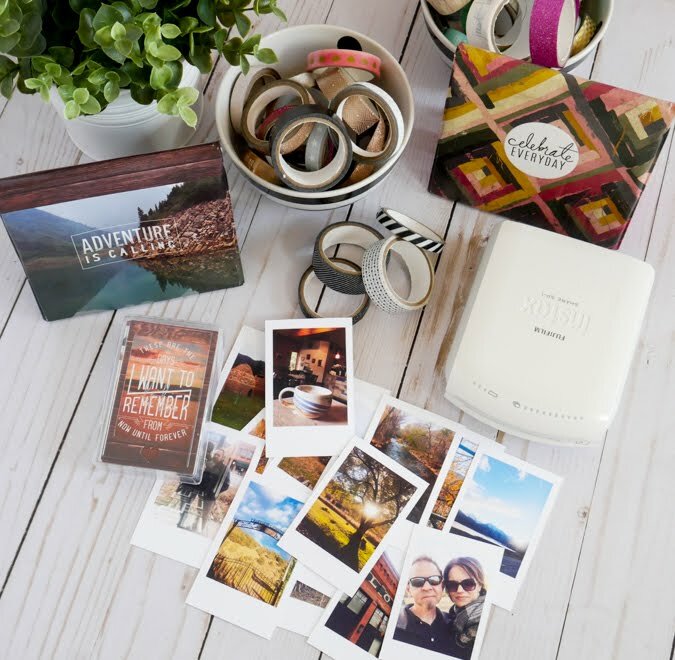 The Instax Share Printer comes in handy printing all kinds of mini photos that fit the Instax Flip Album. I gathered pictures of a recent trip. And that will be the story for this gift album. 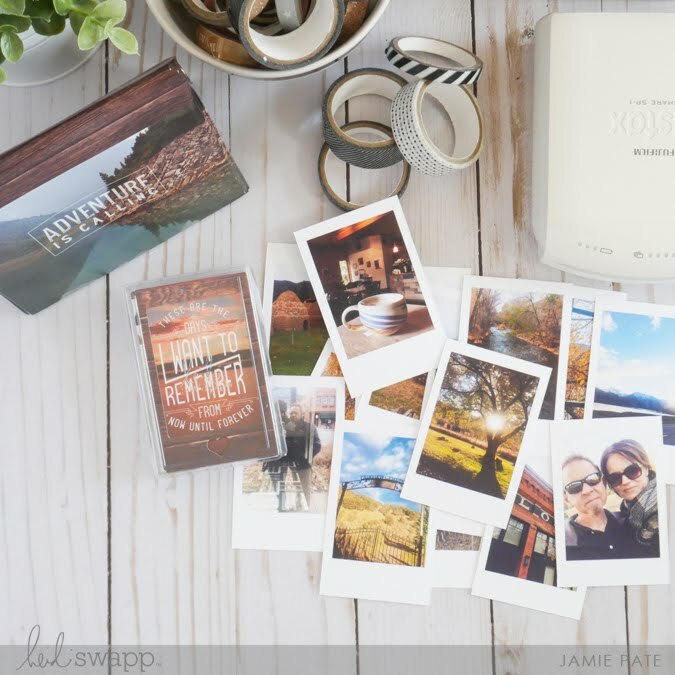 All the Filler Packs from the Instax Vintage Collection are simply needful! I mean you just HAVE to get them all. You can thank me later. I tend to use just one of the themed boxes of Instax size cards per a project. (Pictured here is the Travel themed set.) But who are we kidding...I will be be using from all the packs...they are all just that good. Be sure to check out the Floral and the Friends Filler Cards. And then just tell me that you don't need them. 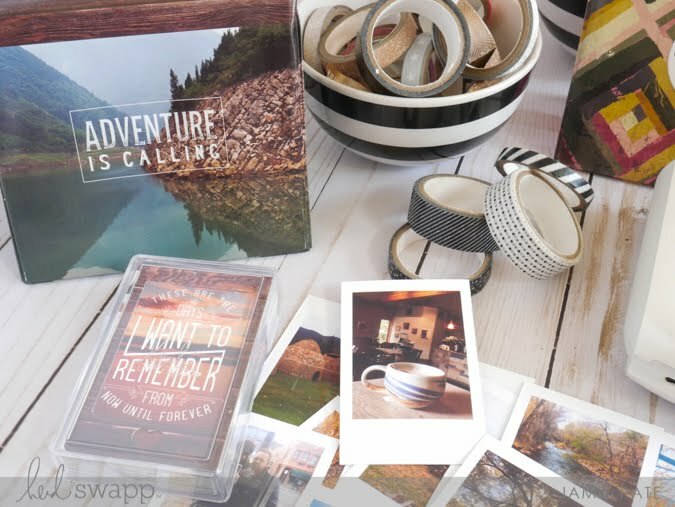 So, for supplies, I have gathered the Adventure Is Calling Flip Album, the Travel Filler Pack (with the other packs available, if needed-wink), photos, and Heidi Swapp Washi Tape, also available at Michaels Stores. Some of my most favorite washi. 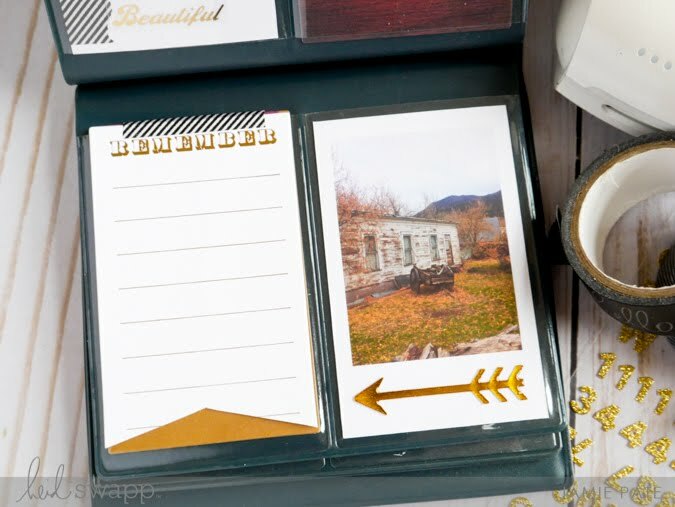 I love adding this simple embellishment to my photos and Filler Cards. Ok...so warning...there may be a little bit of washi overkill. Don't say I didn't warn you. The following images walk through the album as created. 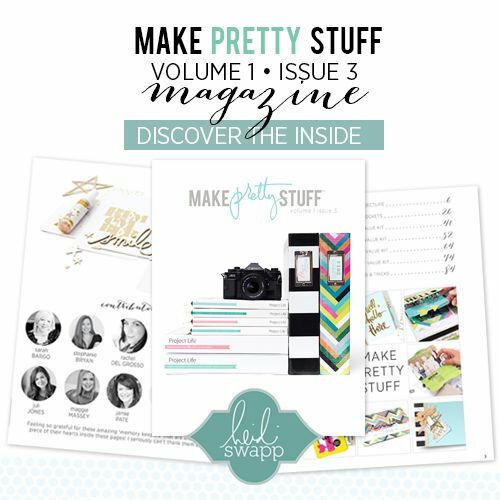 Let me show you how I have added interactive elements, washi tape, hidden journaling plus glitter titles. First we open up to a hinged "Negative Free Zone" card. Clearly this card was chosen because it's pretty and fits the colors in the photo. A bit of washi is added to the edge to show it can be lifted. A journal card is underneath. On the right, the photo is framed with a HELLO glitter frame (Filler Pack). Washi is placed under the HELLO to set it off just a bit. I used glitter letters from this Heidi Swapp Stationery Embellishment Kit. Those letters will be used throughout this album. 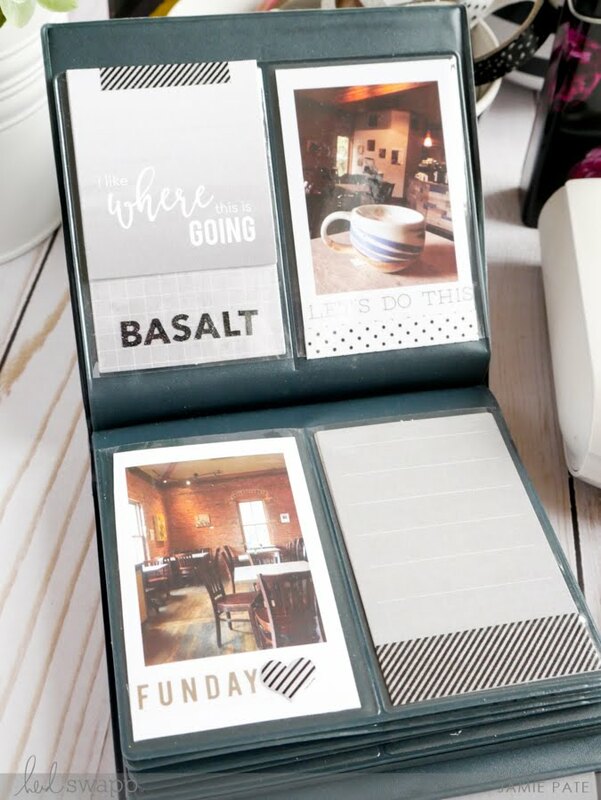 I simply love how they compliment the Filler Pack and easily fit the theme of this mini book. The next page flips up to reveal another interactive piece, because I like the interactive-ness (it's a word...right?). I cut the grey filler card and hinged it over the grid journal card. 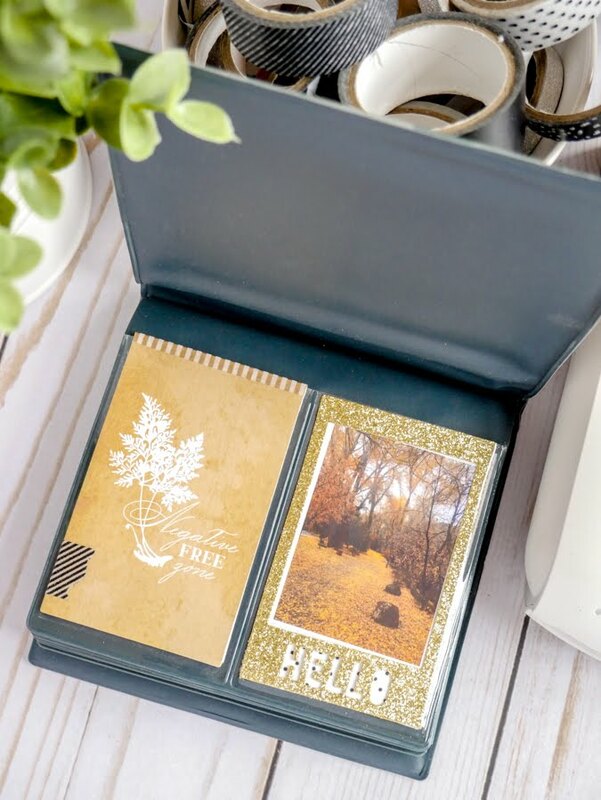 Black glitter letters from the Black Embellishment Kit gives a title to the journal page as well. 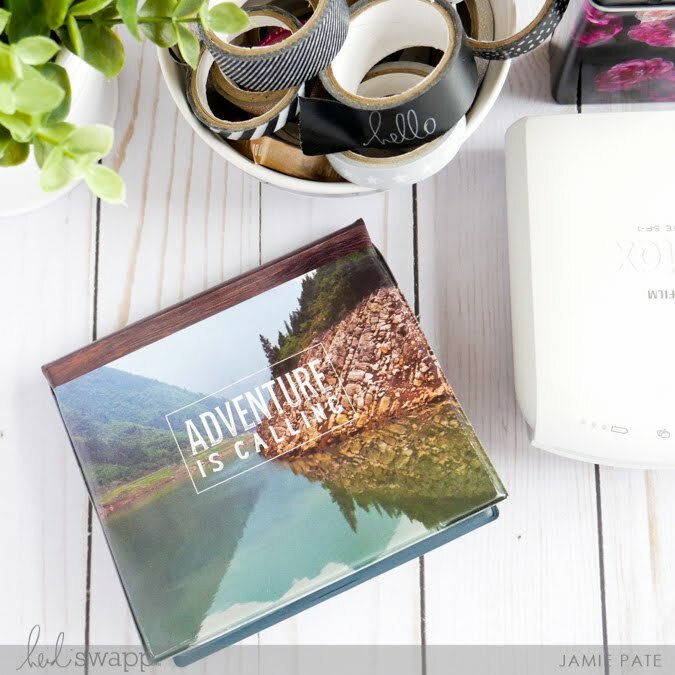 On the right I decorated the photo with one of the clear phrase stickers from the Travel Filler pack plus a strip of washi on the bottom. Next page at the top, on the left, the photo is layered with an arrow die cut frame with a bit of washi sticking up from the photo. I like the look of that black stripe with all the blue. On the right a Filler Card is trimmed to the shape of the word phrase on the card. 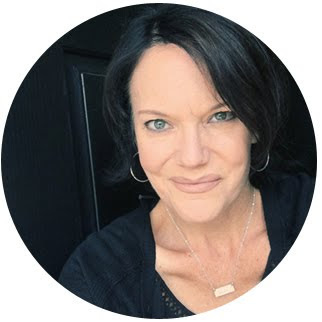 This technique gave a bit more attention to the journaling that will be underneath. 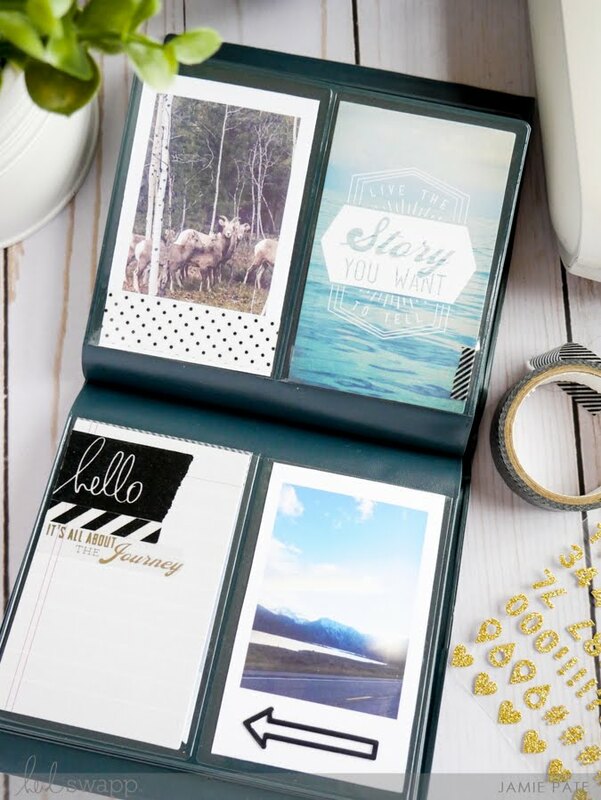 The journal card on the top is dressed up with a strip of black and white striped washi. 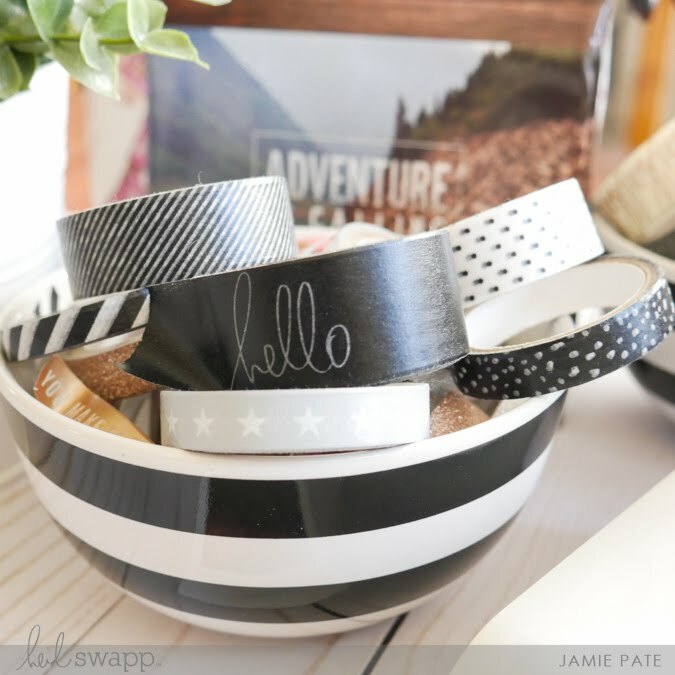 And that great HELLO washi tape adds interest and detail to the photo on the right. Next spread: on the right side I overlapped one of the Sticker Tin journal cards over a Filler Card. 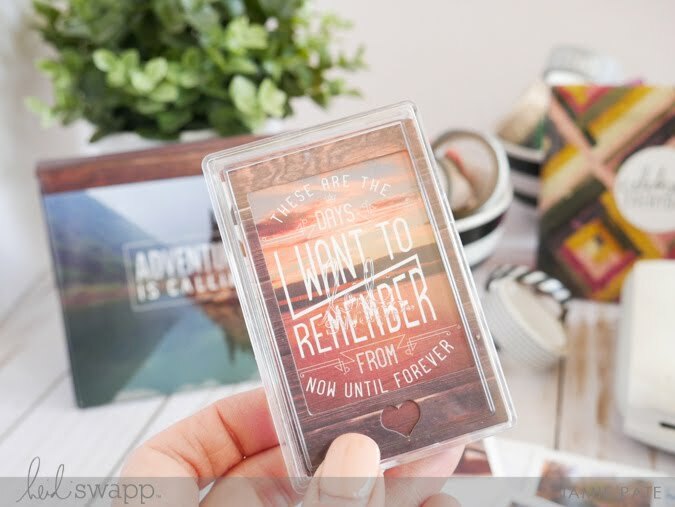 Those cards were designed to adhere to the back of an Instax print. 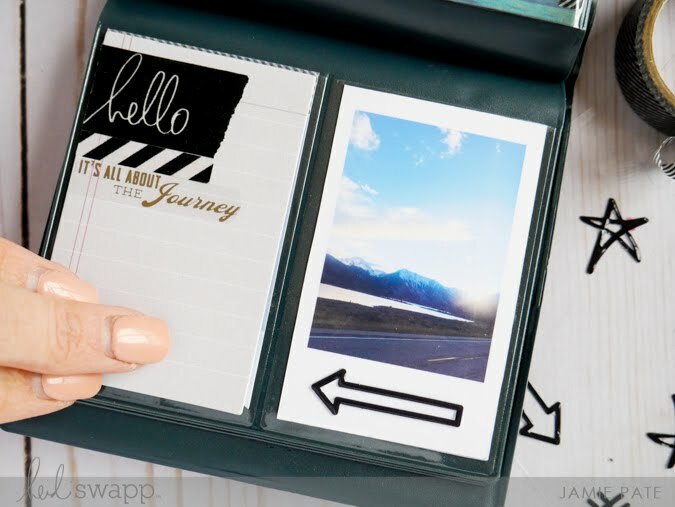 I like using them as title cards and just plain journal cards. You'll see more of that later. I promise. One of my favorite pages is next...I think I like how all the gold and warm tones come together. Oh, and that phrase card on the upper right side? yeah...love that. 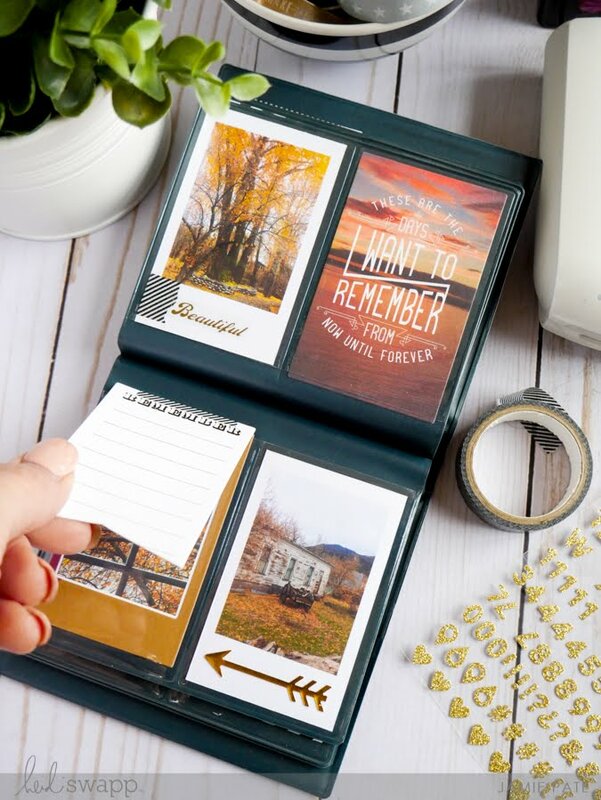 Shown here is another of the Sticker Tin's journal cards. I notched out the bottom a bit so the card underneath could peak out. On the right, a puffy arrow from the Gold Embellishment Kit was used to point the way. That whole trimmed out card with journal card underneath is a bit of theme with me, if you could not tell already. It gives the pages great interest and causes the viewer to interact with the cards. 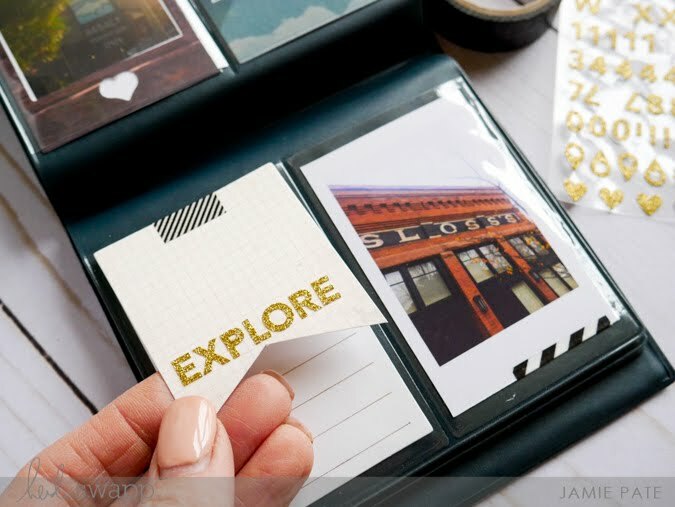 The EXPLORE title is created with more of the Gold Embellishment Kit glitter letters. 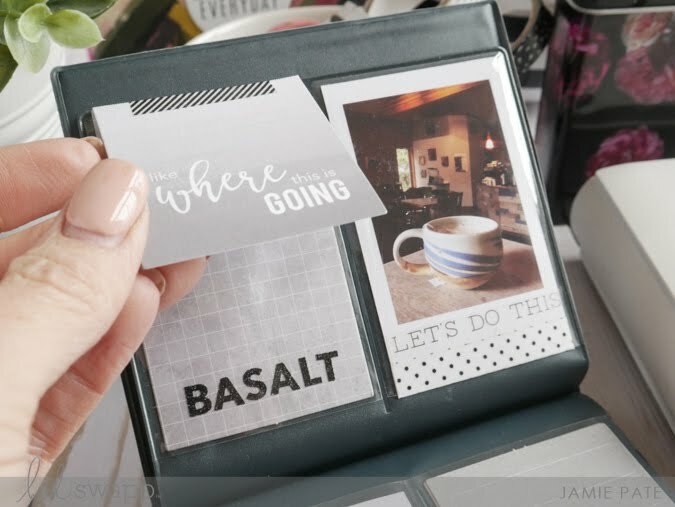 Washi + a clear sticker is added to the journal page as embellishment. The black puffy arrow is from the Stationery Buzzwords. And that wraps up this album. 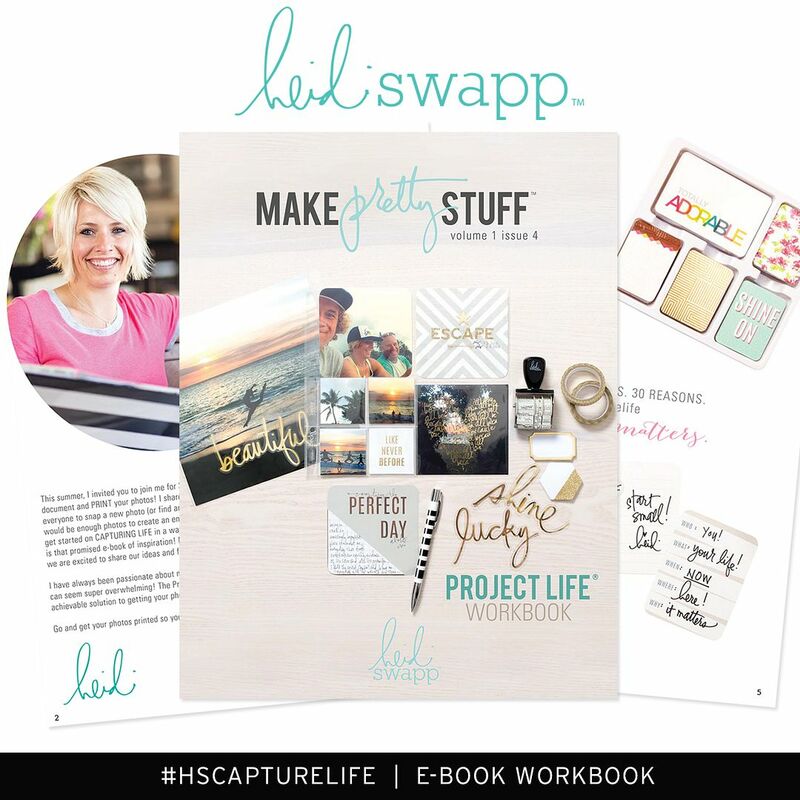 Looking to start your gift making season? Follow the formula I created above. 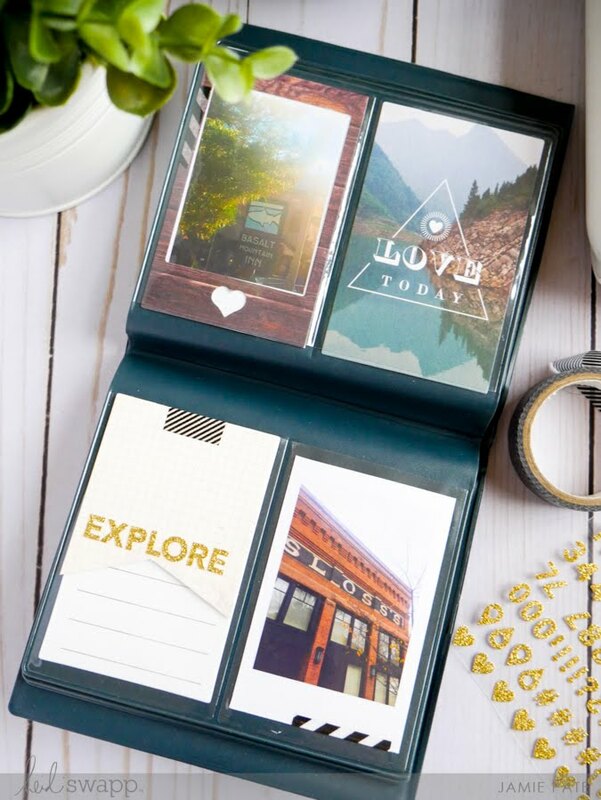 Create an album for that certain someone with photos and your words to tell the story. 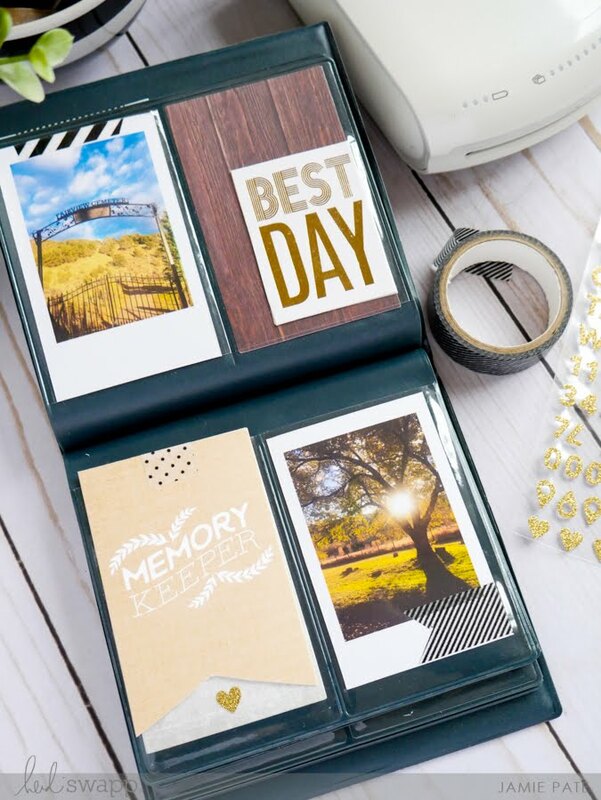 And enjoy the process of making pretty stuff for the people you love with the Instax Vintage Collection.